The detection of preferential flow paths and the characterization of their hydraulic properties are major challenges in fractured rock hydrology. In this study, we propose to use temperature as a passive tracer to characterize fracture connectivity and hydraulic properties. In particular, we propose a new temperature tomography field method in which borehole temperature profiles are measured under different pumping conditions by changing successively the pumping and observation boreholes. To interpret these temperature-depth profiles, we propose a three step inversion-based framework. We consider first an inverse model that allows for automatic permeable fracture detection from borehole temperature profiles under pumping conditions. Then we apply a borehole-scale flow and temperature model to produce flowmeter profiles by inversion of temperature profiles. This second step uses inversion to characterize the relationship between temperature variations with depth and borehole flow velocities (Klepikova et al., 2011). The third inverse step, which exploits cross-borehole flowmeter tests, is aimed at inferring inter-borehole fracture connectivity and transmissivities. This multi-step inverse framework provides a means of including temperature profiles to image fracture hydraulic properties and connectivity. We test the proposed approach with field data obtained from the Ploemeur (N.W. France) fractured rock aquifer, where the full temperature tomography experiment was carried out between three 100 m depth boreholes 10 m apart. We identified several transmissive fractures and their connectivity which correspond to known fractures and corroborate well with independent information, including available borehole flowmeter tests and geophysical data. 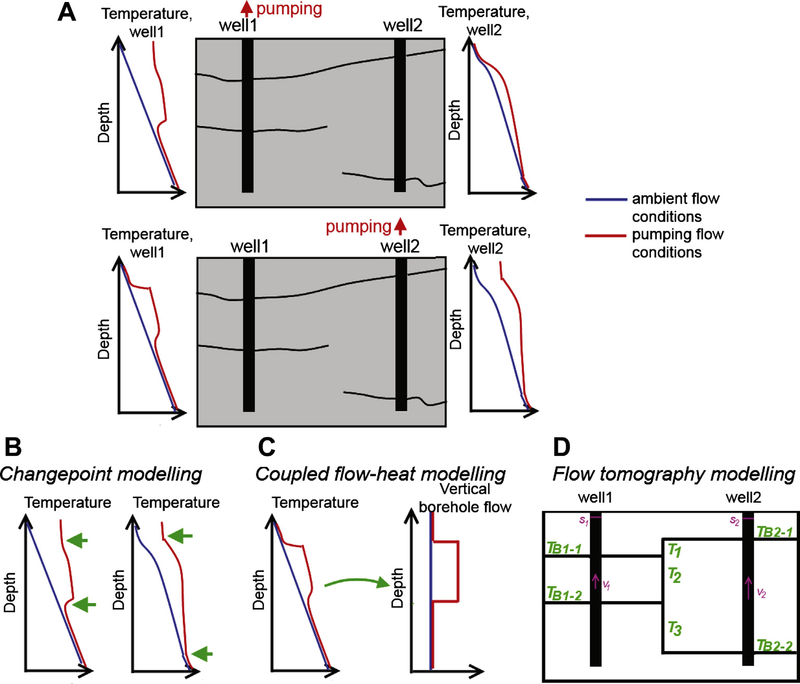 Hence, although indirect, temperature tomography appears to be a promising approach for characterizing connectivity patterns and transmissivities of the main flow paths in fractured rock.